Charles and Ray Eames revolutionized furniture production with their molded-plywood designs. 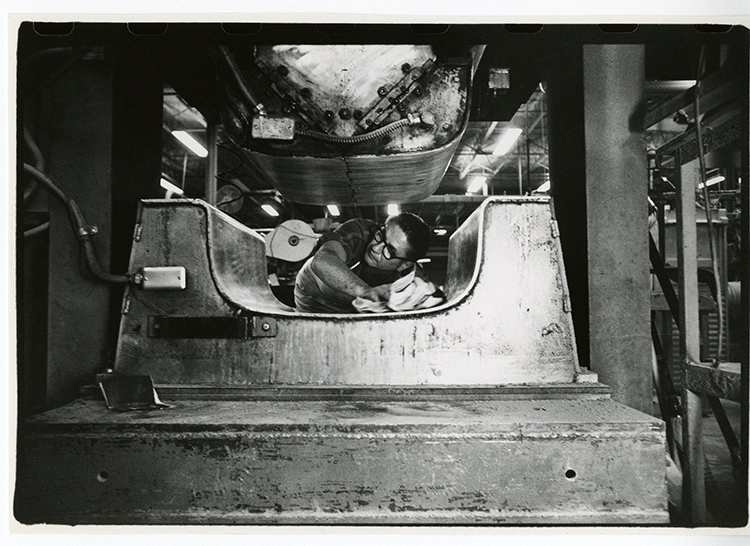 Here, a worker readies a machine to press the wood veneer into its famous shape shape in 1978. While technology keeps evolving, little has changed in the way the ELO is made since it was introduced in 1956. To ensure continuity of craftsmanship, new workers are paired with experienced mentors who pass down tips and techniques. The average maker has been working with the product for 10 years. Even after 60 years, each piece is hand-assembled in the United States. That human touch makes sure each piece is thoughtfully put together, and that natural variations in the leather and wood are taken into account. By the time it's ready to be shipped, the ELO has been worked on by many human hands, yet its impact on the environment is minimal. The company uses sustainably harvested wood and limits waste and energy use at every step of the process, and each piece is built to last for generations. The Eames Lounge Chair and Ottoman is a favorite piece of midcentury design. And, like many furniture icons, this Charles and Ray Eames for Herman Miller design has been knocked off again and again. Staunch modernists may always stand up for the real deal, but others are tempted to question how its premium price can be justified when a reproduction can be found at a fraction of the cost. Beyond issues of intellectual property, it turns out there are plenty of reasons authenticity matters, ranging from safety to sustainability. Here, we take a look at another thing that sets these pieces apart: the craftmanship behind each and every chair Herman Miller makes in their western Michigan factory. To learn more about authenticity, join us at Dwell on Design New York, where Ben Watson, executive creative director of Herman Miller, will be joined by Dahlia Latif, president of the Soho Design District, and Paolo Cravedi of Be Original to discuss The Real Cost of Rip-Offs on Friday, October 2, from 2:45 p.m. to 3:45 p.m.
Dwell on Design New York, which takes place at Skylight Clarkson Sq from Oct. 2-4, will feature three days of stimulating discussions with industry leaders. Get your tickets now to join us for the show. For a full list of panelists, see this page of Dwell on Design New York's website.